Samantha Platania is a marketing manager at Meadows Urquhart Acree & Cook. Samantha works with the management team to help them understand how to bring their expertise to potential new clients. With over seven years of experience, she tracks and manages the business development goals and activities for specific industry groups, and designs and creates all firm marketing materials. 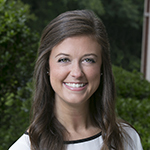 Samantha has an active role in the firm’s recruiting strategy and maintains the website and content. Additionally, she plans and executes both client and internal firm events. Samantha graduated from James Madison University with a degree in Media Arts & Design. Outside of the office, her interests include exploring Richmond, cooking, and running.